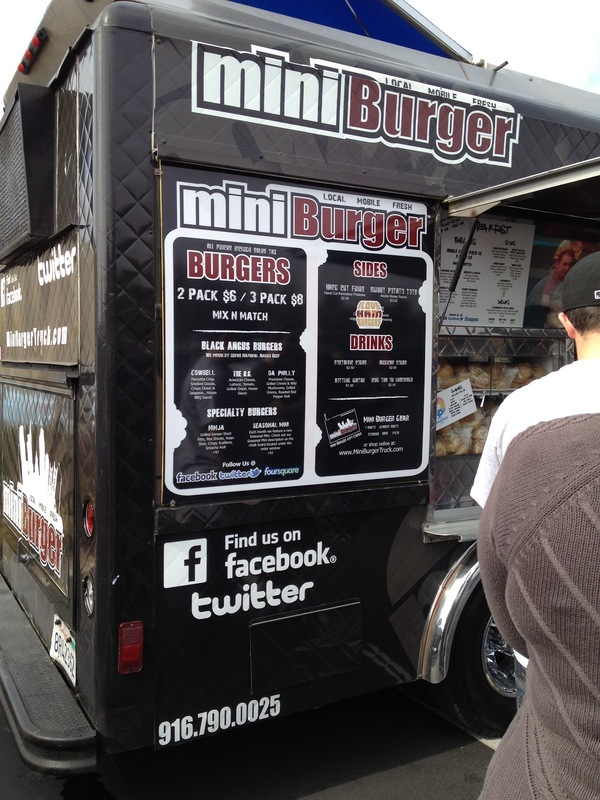 I don’t know where I first heard about the Mini Burger Truck, but I was immediately intrigued by the idea. Readers should not take this post’s title literally—I never really chased the Mini Burger Truck around town; rather, I kept tabs on the truck’s whereabouts via its Twitter (@MiniBurgerTruck), which informs all its followers where the truck is currently parked and where it plans to go next. 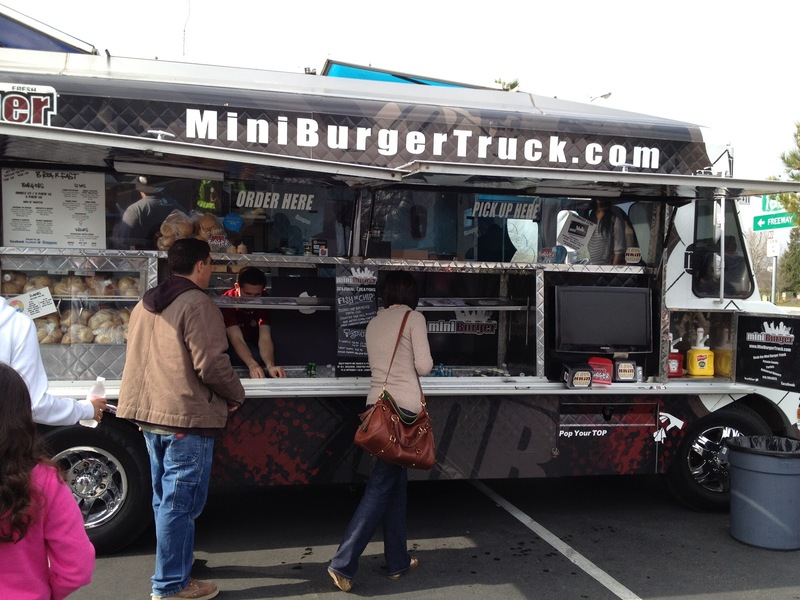 Monday through Friday, I would log on to Twitter and hope the Mini Burger Truck would park within walking distance of my workplace. It did a few times, but I was never available on those days. The truck often parked off Exposition Blvd., in the REI parking lot, on Saturdays, and that was where I first sampled the Mini Burger Truck’s fare. When I pulled up to the truck, I noticed a long line of people waiting to place their orders and another large group of people milling about, waiting for their food. No one was complaining, however; the order line moved along at a good clip, and the completed orders were delivered briskly. This was impressive, since only three people were working in the truck, and one of them was solely taking orders, boxing up completed orders, and handing them out. The Cowbell was very good; juicy Black Angus beef, with the distinctive pancetta and smoked Gouda cheese on top of the patty, made for an excellent departure from the standard hamburger. 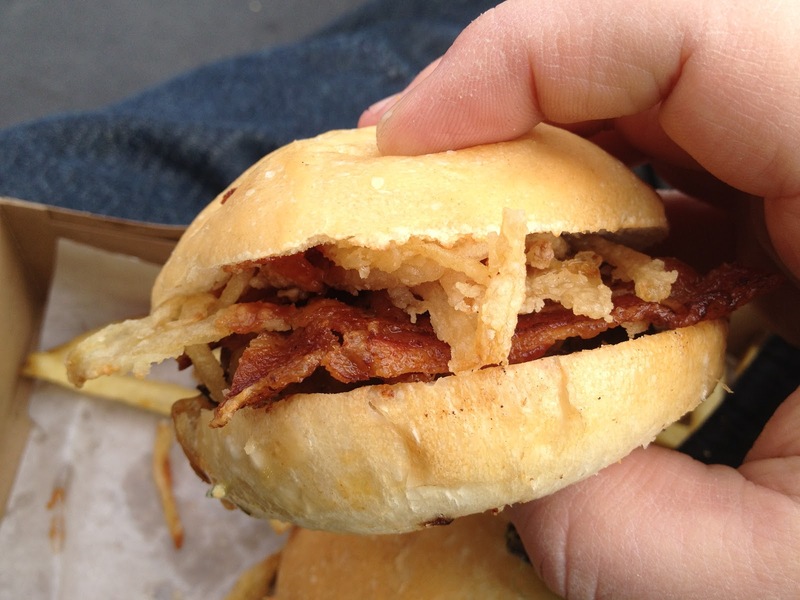 To top off this gourmet version of a cowboy burger, Mini Burger adds crispy onions and jalapenos. Remarkably, the jalapenos were not very spicy. (Whether that is a good thing depends on one’s tolerance for spicy food.) Served on a little bun, the Cowbell was drenched in an excellent combination of House dressing and barbecue sauce. The Ninja Burger was even better, with its grilled Korean short ribs standing in for a beef patty, giving it a distinctive sweet taste and just the right amount of pea shoots and Asian slaw. Crispy scallions wonderfully complemented the sweet meat, and the sriracha aioli gave this unique burger a touch of heat, but not too much. food to go for obvious reasons. ﻿ ﻿ The fries were plentiful, flavorful, and salty, but also a bit soggy. 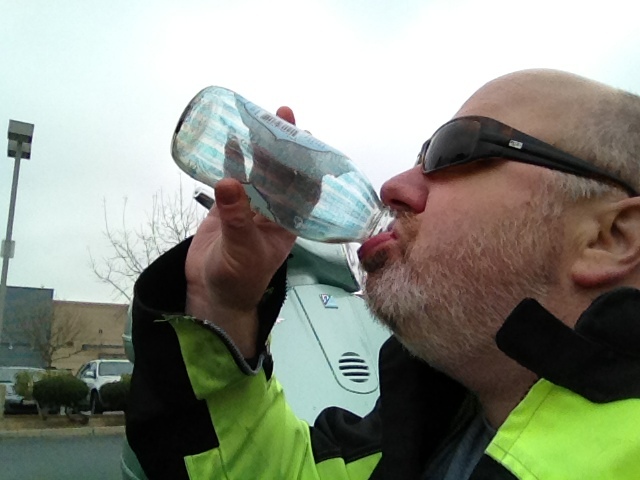 I enjoyed an excellent bottle of iced tea, called Harney & Sons Organic Black. After this lunch, I began searching for grocery stores that carried this excellent tea; it is the best black tea I have ever tasted. Waxing on about the tea served at a burger place is tangential, I realize, but this stuff was wonderful. On a subsequent visit, I ordered two other burgers: the OG Burger and Da Philly. Both had excellent ingredients, but they were undercooked. The only burger I have not tried is the seasonal Specialty, which is currently the Fish & Chips burger. The burger patty is fried cod, with fries as the coating. On my second visit, I tried the Sweet Potato Tater Tots and found they were much better than the regular fries. The Mini Burger Truck is not a completely unique idea; checking out Sacramento Mobile Food, known as SactoMoFo, reveals over 15 lunch trucks or “mobile kitchens.” You can find additional information on the blog Food Truck Nerd, although it focuses on Bay Area trucks. Of course, with a chuck wagon affair, the food is intended to be eaten at home or in one’s car. 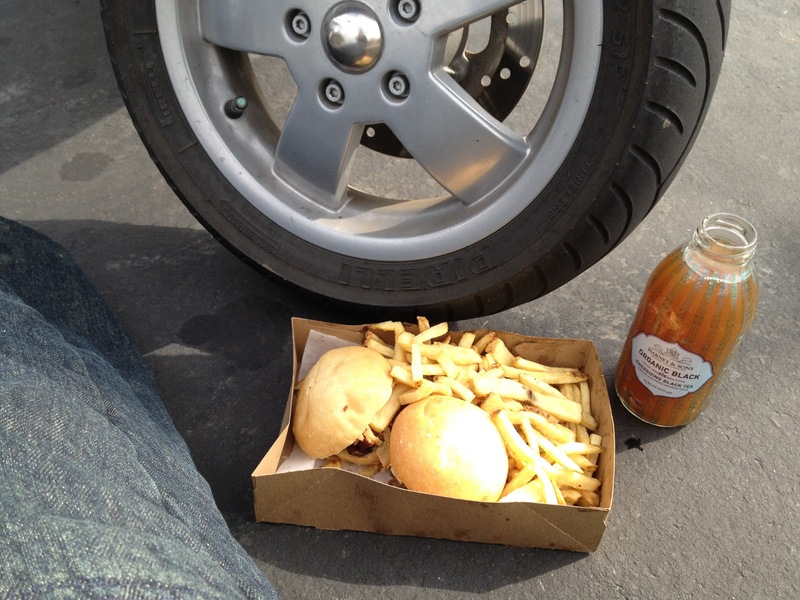 I ate next to my scooter in the parking lot, however, so the shortage of napkins was annoying. It is obviously very difficult to monitor and replenish such items, including bottled or canned drinks and accoutrements, when the staff members are located directly over these items. If you enjoy mobile kitchens, you should be aware they could disappear. California Assembly bill AB1678, if passed by the Legislature, would ban these trucks from parking 1500 feet from schools. This would mean the Mini Burger Truck, and other food trucks, could not park in more than 60 percent of Sacramento’s urban areas. The restriction would be far worse in cities like San Francisco. Call your legislator! I’d be pimping this great iced tea if I minded the label.